Hellenic Warfare Mod is a total conversion mod for Armed Assault. The mod is trying to bring Greek modern army into Armed Assault. A whole new set of Vehicles, Units, Weapons, Objects, GUI, sounds and even islands based on real geographical terrain data of Greece, and many more. A whole new campaign (fictional) divided into two phases (sub campaigns) for maximum game play enjoyment, along with a lot of stand alone missions, both for single player and multiplayer all of them featuring Greek modern army. Currently the mod is at development phase, estimated time of release currently unknown. For more information and progress releases you can visit the mod page. 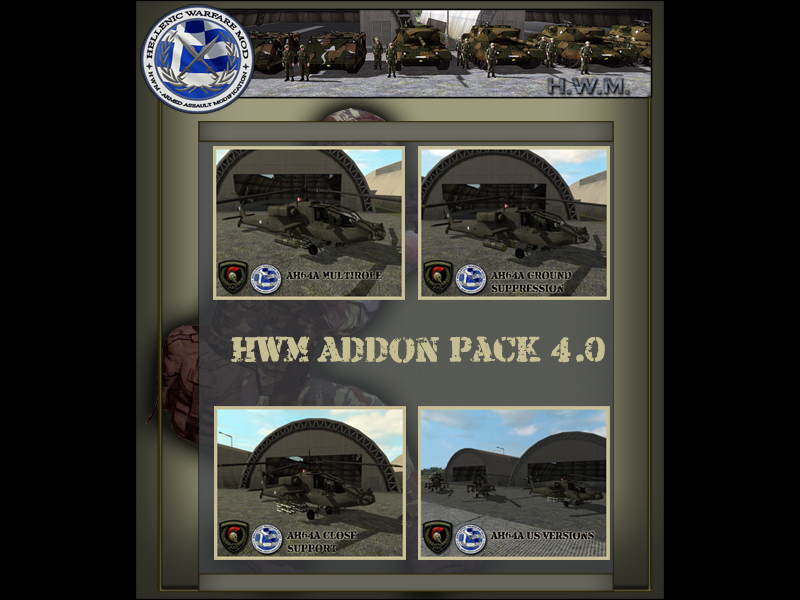 HWM Addon Pack 4.0 is out!! this new pack contains the well known tank killer AH64A in 3 variations for Multirole missions, Ground Suppression and Close Support missions. In Greek, US and RACS versions. AH64A also featuring MFD/FLIR/TADS/LHADSS systems (Developed By Dr Eyeball) that maximazie players experience with unique characteristics which brings the helicopter as close as possible to real life.Also in this pack we have included Greek Army Markers for the mission makers.